« Be non-violent. really? why and how? Most people want to go through the day in peace without getting injured in any way. We want our children to be safe. We want our parents to be safe. We want our brothers and sisters to be safe. We want our friends to be safe. We want ourselves to be safe. Unfortunately, life offers many challenges. We worry about our family getting hurt. We worry about violence to our families, friends, and community. We hear about violence when countries go to war. We pray for an era of nonviolence when people everywhere, including our own families and selves, are free of violence. This physical world is filled with violence, challenges, and dangers. From the moment we are born until our ultimate end, we face illness, accidents, mishaps, losses, and disasters both man-made and natural. The news contains one event after another filled with violence that can bring fear and panic into our lives. People worry about crime, illness, financial loss and disasters such as floods, volcanoes, earthquakes, and other threats to our lives. Is there any way to lead our lives so that we are not engulfed by fear or violence? Can we navigate through the roadblocks on our way to happiness so that we can lead a life of calm, peace, and joy? Although people have prayed for an era of nonviolence for centuries, history shows there has not yet been a single period without war. Is there any way then to end violence and have a period of nonviolence on this planet? Yes, there is. Meditation is the medium with is common across the world irrespective of geography, religion, class, color and creed. The main purpose of meditation in to go within ourselves and find out WHO AM I. Its purpose is to give each person self driven proof there is something greater than everything which is SOUL that lives on after death living the body behind. Each and everyone needs to experience this feeling which can only happen with Meditation where you (Self) comes closer day by day to an ultimate Supreme and to feel the Oneness with HIM. Each one us start feeling connected with the Supreme and then you start let go of fear, hate, greed, anxiety, and worries. The culmination of each and every one practicing it results into creating a oneness feeling, peaceful environment and equanimity among each other. We become forgiving, kind and happy where we are and how we are!! Isn’t that a beautiful feeling…a beautiful world to be…a beautiful life to live!!!!!! about Roopak Desai: Roopak is a resident of Monroe, New Jersey and works in the Information Technology industry. 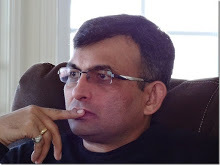 He has an MBA in Technology Management from NJIT; MS from IIT, Chicago; M.Tech from IIT, Mumbai. His goal is to inspire and motivate to help people succeed and to make a difference wherever he can.